Salaam Bombay! (Hindi: सलाम बॉम्बे!) 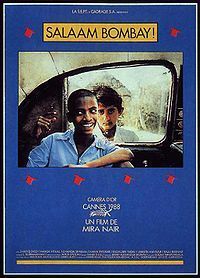 is a 1988 Hindi film directed by Mira Nair, and screenwritten by her longtime creative collaborator, Sooni Taraporevala. The film chronicles the day-to-day life of children living on the streets of Mumbai (formerly known as Bombay). It won the National Film Award for Best Feature Film in Hindi, the National Board of Review Award for Top Foreign Film, the Golden Camera and Audience Awards at the Cannes Film Festival, and three awards at the Montréal World Film Festival. The film was also nominated for the Academy Award for Best Foreign Language Film.